BANGI, 10 November 2014 – Fatwas, or Islamic edicts, should only be made after getting views not only of religious scholars and imams but also experts in various fields related to the issue concerned. 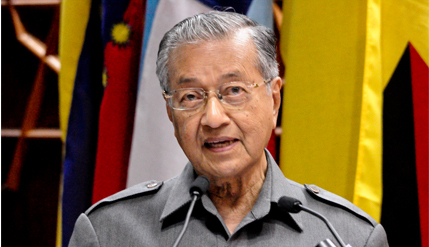 Honorary President of the Perdana Leadership Foundation Tun Dr Mahathir Mohamad said the religious experts should listen to doctors, psychologists, psychiatrists, sociologists and academics before judging certain actions by some to be un-Islamic. He said a fatwa by ulamas alone were inadequate and not well-regarded by many because of different interpretations on various Islamic injunctions he told reporters after opening UKM’s 5th International Conference of Social Sciences and Humanities (ICOSH-UKM) 2014. Tun Mahathir said fatwas must not be based only on Islamic principles but should also include research and various views. “We need to have fatwas on the many challenges facing Muslims. But they should only be made after a thorough study and discussions by all experts, including the realities of life,” he said. He was asked to comment the court of appeal’s recent judgement declaring as unconstitutional a provision in the Negeri Sembilan Syariah Criminal Enactment prohibiting cross-dressing and trans-gender males. The former Prime Minister said that while the Quran is perfect, it is man’s interpretation of the holy book that can be inaccurate and over time become irrelevant. “We need to do some soul-searching, some revisions about the current teachings of Islam. We must go back to the real source of our religion, the Quran,” he said. The 5th ICOSH-UKM conference is a forum to debate concepts and studies from the social sciences and humanities which can contribute to a better civilization. The objective is to build collaboration towards academic and research excellence amongst academics and knowledge seekers.